Countdown for climate action—are 10 days enough? The clock is ticking and the countdown has begun. As of June 30, there are less than five months left before the leaders of the world meet in Paris at the United Nations Framework Convention on Climate Change (UNFCCC) 21st Conference of the Parties (COP21) to make commitments to address climate change and attempt to halt the devastating effects it has and will continue to have on all humankind. In advance of this December meeting, it is imperative that the elements of an effective, efficient, and equitable gender-responsive climate change framework are in place. From every corner of the planet, clarion calls sound for action and decision making on climate change. Most recently, Pope Francis released the first papal encyclical focused on the environment, “Laudato Si.” In his letter, he urges the world to engage in a “new dialogue about how we are shaping the future of our planet. We need a conversation which includes everyone, since the environmental challenge we are undergoing, and its human roots, concern and affect us all.” His voice joins the many women and men of communities, scientists, activists, theologians and civil society groups that have already emphatically spoken out on this issue. In June, the International Union for Conservation of Nature’s (IUCN) Global Gender Office (GGO) representatives attended the intersessional UNFCCC negotiations in Bonn, Germany. Parties to the UNFCCC gathered at this mid-year meeting to continue making progress toward the next global climate change agreement (often referred to as the “post-2015” climate change agreement). At IUCN, GGO has provided inputs on areas for possible collaboration toward the effective implementation of UNFCCC gender mandates. These are meant to guide and reinforce implementation of a two year programme to advance gender equality and achieve gender-responsive climate policy in all relevant activities while also moving words into action—international policy frameworks towards on-the-ground national strategies, which will ensure women and men are equally considered, included and empowered within climate change policy, planning, and implementation. The feelings in the corridors in Bonn, as GGO participated in workshops, discussed the importance of gender-responsive policies, and supported negotiators in a new climate change framework, ranged from impatience to desperation. Indeed, there are five months remaining until COP21, however there are less than 10 days of negotiations left until the Paris meeting—only two more meetings of negotiators, one in August and one in October. This is not very much time at all to finalize the conditions of the framework and have all Parties agree to implementation. As GGO participated in these crucial discussions about the changing climate, we wondered: Can those most affected by climate change—the poor and the disenfranchised—afford to wait on stalled environmental decisions? What messages of hope and promise for the future can we report back to them? Do we still have time to change the course of our environment or is it too late to undo the damage we’ve already inflicted? 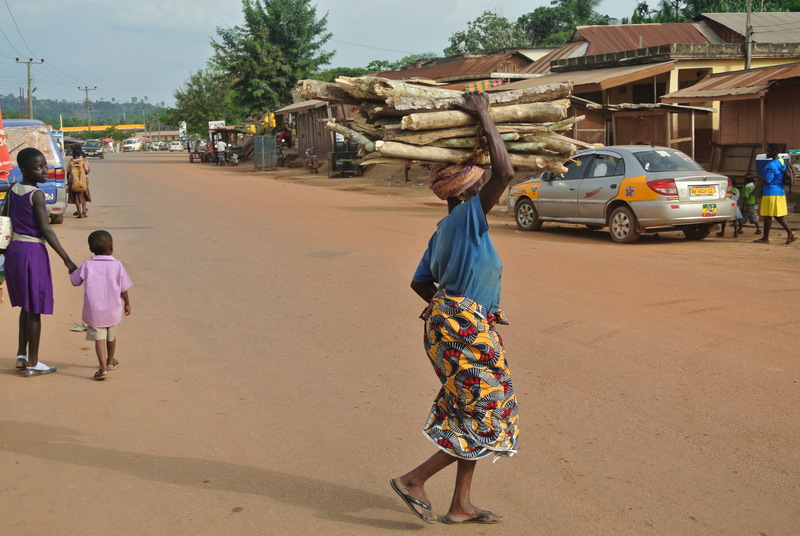 Woman transports fuelwood on her head in Ghana. In “Laudato Si,” Pope Francis references women 11 times, underscoring the importance of their specific inclusion and untapped potential in finding solutions to the negative effects of climate change. His words express what lies at the heart of GGO’s work, “Climate change is a global problem with grave implications: environmental, social, economic, political and for the distribution of goods. It represents one of the principal challenges facing humanity in our day. Its worst impact will probably be felt by developing countries in coming decades. Many of the poor live in areas particularly affected by phenomena related to warming, and their means of subsistence are largely dependent on natural reserves and ecosystemic services such as agriculture, fishing and forestry. They have no other financial activities or resources which can enable them to adapt to climate change or to face natural disasters, and their access to social services and protection is very limited.” Gender equality and women’s empowerment can open the door to achieve greater progress in better overall development outcomes, including reducing greenhouse gases and building resilience to climate change impacts—the world must seize this opportunity! With only five months to go to COP21 in Paris and 10 days of negotiations, GGO is committed to stay focused on and help negotiators agree on an ambitious, equitable, and gender-responsive climate change framework. GGO is supporting and encouraging negotiators to make progress toward finalizing and adopting an ambitious, fair, and balanced 2015 agreement that will progressively enable the increase in global average temperature to be held below 2 °C or 1.5 °C above pre-industrial levels, maintaining the highest possible level of environmental integrity and respecting gender equality and human rights. Some are already taking measures that go beyond current mandates—for example, just this past Wednesday the Hague District Court set a precedent by ordering the Government to reduce greenhouse gas emissions above and beyond current mandated measures. By 2020 it is now required that in the next five years greenhouse gas emissions are reduced by at least 25% from 1990 levels, instead of the 16% rule set by current environmental policy. Globally, there are leaders taking firm stances on climate change policies and striving to make a difference in environmental decision making, yet there are also those who chose to ignore the scientific evidence and disregard the risks posed by a climate continuing to change. To reiterate the words of Pope Francis, “Our lack of response to these tragedies involving our brothers and sisters points to the loss of that sense of responsibility for our fellow men and women upon which all civil society is founded.” We cannot afford to not respond—the time for action is now.